Notes On the Original “Organiverse Portfolio"
The Organiverse Handset project is a collaboration with Brian W. Johnson. Created in Morocco and the island of Madeira by Netherlands born international artist Henri van Bentum. His work is in over 225 public & private collections around the world. All 100 mandalas are done in pointillism, dot by dot. "The work of Henri van Bentum reminds us of organic processes on the cosmic and microcosmic levels. His work helps me understand the vastness, complexity and beauty of the cosmos. van Bentum's work is executed with a fine sense of colour and other elements. I see his work as a paradigm for enduring works of art in the future." Former Professor Leslie Mezei, Computer Sciences, U of T.
Organiverse is a meditational aid or 21st century kasina device. It is used to enhance meditation practice. It works by simply placing the cards face-out in the display module and, after allowing for some time to pass, move the front facing card to the back of the holder. In this way you will rotate through the Organiverse mandalas in sequence. The idea is to go through the whole series of 100 spheres. 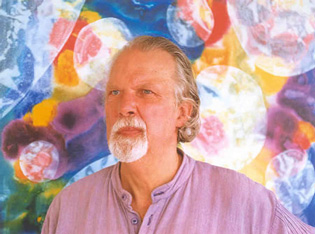 Henri van Bentum was one of the first eco-artists beginning in the 1950’s. He has always advocated ‘Small is Beautiful’ and works on a small scale, using a minimum of resources for maximum results. The Organiverse rotation handset comes in a unique wood display holder made from recovered wood from Vancouver Island, as part of the Woodworkers Guild “Wood Recovery Project”. This box is made from recovered Garry Oak. 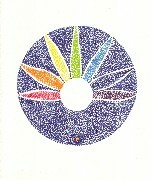 This unique series of pointillism mandalas was started in Morocco in 1972. van Bentum was living in the former Phoenician fishing village of Essaouira, and afterwards moved to the island of Madeira where the work was completed. The portfolio consists of twenty-five pages, each with four spherical drawings 8 � cm in diameter. The work was made into a 35mm colour and sound short film by filmmaker Julius Kohanyi in 1973. He was commissioned for this project by the Ontario Arts Council. Since that time, the film has represented Canada in major international film festivals around the world. The artist�s motivation when he created the series was to have it reproduced in a limited edition and made available to libraries, art schools, universities, museums and a selected few private collectors. Although pleased with the film�s success, van Bentum�s purpose had not been realized. The contemplative nature of the work, with its refined visual sensibility and meditative characters, was lost on the huge 35mm theatre screens. Over the years, van Bentum tried to get the Organiverse Portfolio printed. However an accurate rendering of the colour was impossible owing to the pointillist technique (using traditional printing technology). Now, through a unique partnership between the artist and Hewlett Packard (HP), the portfolio has been scanned and reproduced using the latest HP imaging technology in a limited edition of twenty-five sets. 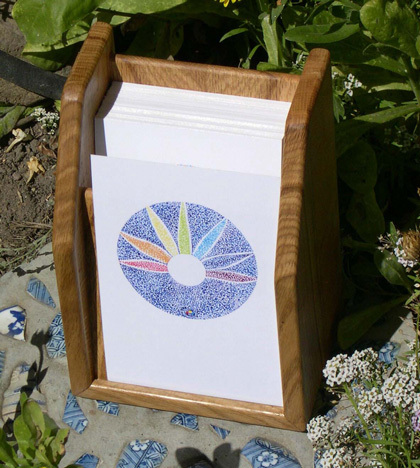 These scans were further used to create the new Organiverse: Art Meditation Ecology set, featuring each mandala on a separate card. Following a successful experiment with HP by van Bentum, the artist had a reverse edition of the original ORGANIVERSE set created, called “Starry Night”. (Click for a video). van Bentum would like to thank Joe Carr, Brian W. Johnson and Garry Sedun for their technical assistance. �While we are occupied with our daily existence, a great mystery takes place: Life, evolving in every form, from micro to the macro cosmos. We on our plant Earth finally begin to realize there may be other life in the Universe. With this project, we share insights into this enigma called life, embracing art, science and ecology � a timeless universalism of growth, evolution or genesis --- we have the microscope and telescope within, and an unknown destiny. This work also embraces the interplay and relationship of Colour. It is further a study in organic development. The invisible is made visible, through dots. We are biologically no more nor less than dots --- atoms. The planets and even the Sun are only a spot in space, depending from where you look. We have seen, when astronauts go further and further away from Earth, our receding planet then quickly disappears into what one astronaut simply called �a dot�. We leave our own world behind, and find a new and alien world, until eventually we leave even that, continuing further � to another �dot�, only to discover that it is again an unknown giant in space.